First of all, a BIG thank you to everyone for a wonderful summer! We had a blast, and we hope you did too! Now we are looking forward to fall, and we are back in action with our storytimes and fall programming starting this week! We hope you'll come join us for stories, songs, and more. Check out our Events calendar for dates and times! Eggs! Beyond the chocolate and jelly beans within! I just realized that the Easter Bunny has to come for a visit AT THE END OF THIS WEEK. My family does fly by the seat of our pants, so this should not be unexpected. We also LOVE candy, but I'm pretty sure we have candy from last Easter somewhere in the kitchen. I know that we have Halloween candy. I didn't want to be a bummer of a Mother, but I also don't want to have tons of stuff hiding everywhere. So I started hunting around on Pinterest, which may be one of my second homes. 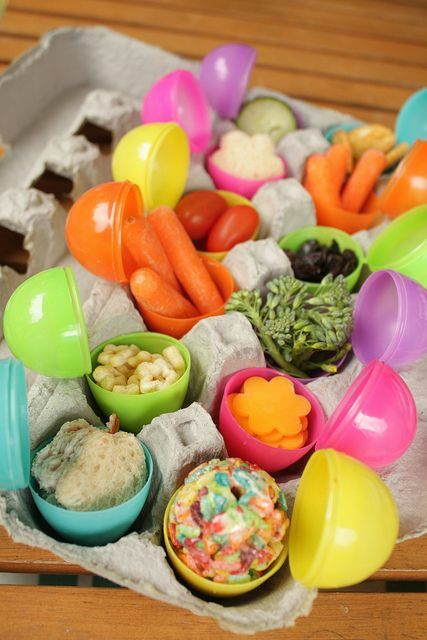 I found this board, and it looks pretty awesome, so for those of you that celebrate Easter in one way or another, I couldn't not share it with all of you! For those of you with your own ideas, don't hide them, share them! I just found out about this website that we have access to! Libraries are essential to Family Literacy. In New York State, libraries bridge the gap for those who may not have access to resources for a variety of reasons. Libraries educate the whole family by providing computer and internet access, materials such as books and music, access to health information, and interaction with staff that are skilled in programming to engage young children to learn. The New York State Library hopes that families across New York State will use this interactive calendar to develop a love for books and learning that will last a lifetime. The calendar uses multimedia to enhance books, songs, and family health and bring these components to life. If families can only spend a few minutes together, this calendar will give them something they can use to make sure that this is quality time as well as educational time. Good grief! Its a monster! ... Oh wait. One of the sad things about winter. 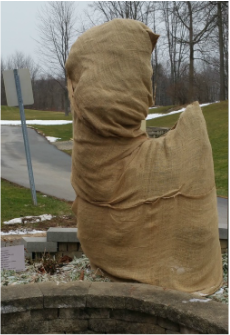 All of our special topiary friends hiding from the cold. Anyone else want to hide from the cold? The maker space program? a success! We had a blast on Tuesday! 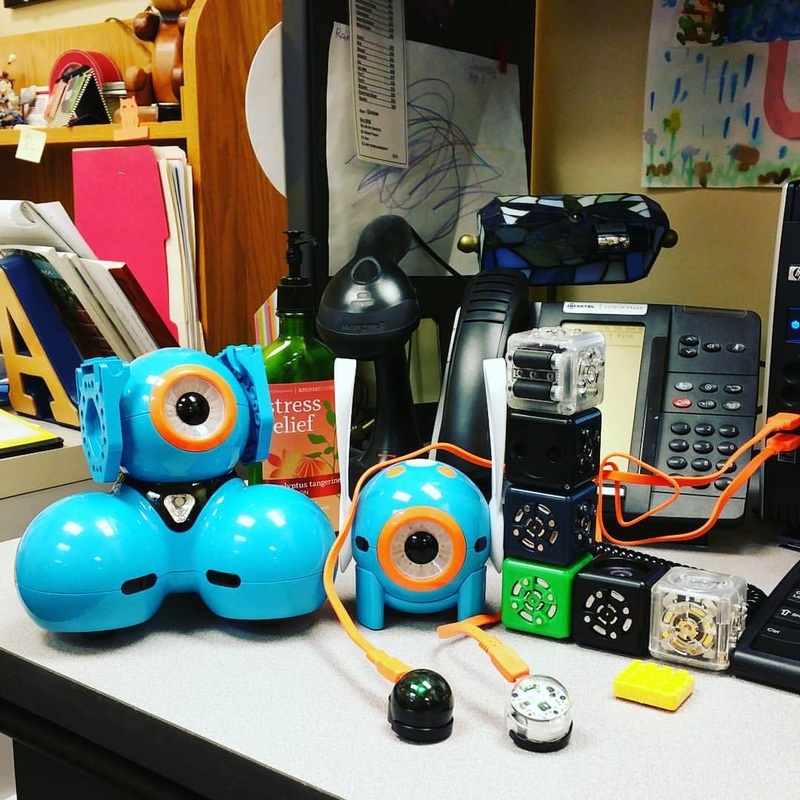 Our robot friends hung out at my desk, charging up, and then, later, we had a super time! We taught Dash and Dot how to do different things. We found out how connecting the cubelets in different ways caused them to do different things. Plus we used different color markers to make the ozobots go into different directions and spin around! Robots not your cup of tea? we had kinex and snap circuits! Don't worry though, we also had squares of paper that you could use to zen doodle! Do all these words confuse you? Come to our next maker space on February 16 at 6pm! S.T.E.A.M. is becoming a pretty normal part of life now. In fact, we'll be starting to have a "maker space" where you can play with all sorts of things that are considered parts of Science, Technology, Electronics, Art, and Mechanics. Come in and create with technology of all kinds. Not in a technology kind of mood? Come in and do a craft or another fun activity! Do you have a hobby or craft you enjoy? Bring it in and show us! Registration is not required. Meets the third Tuesday of the month at 6 pm. Unfortunately, while things are changing for girls, there still isn't quite so much push for girls to make use of science or technology. Just have a look at your local toy store. Luckily authors are starting to realize that this needs to change. Check out this book list of awesome science fiction especially made to encourage girls! I love sharing stories with my little ones and sharing crafts with everyone!